The scheme is for carers who may worry about what will happen to the person they care for if they (the carer) is taken ill or has an accident or another emergency to deal with. Both you and the person you care for will know that an emergency plan can be put into action at any time. Carers have said that this gives them peace of mind. The scheme is a partnership between York Carers Centre and ‘Be Independent’ (formerly Warden Call Service). The scheme is free. 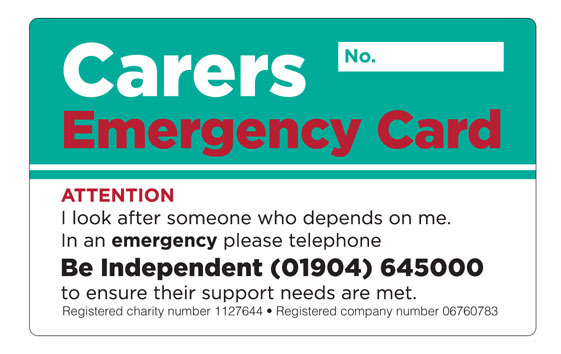 Carers have an emergency card that they keep with them at all times. In an emergency anyone who finds this card can contact ‘Be Independent’ using the emergency number on the card. Staff at ‘Be Independent’ will look up the carer’s details and contact their emergency contacts if appropriate. To join the York scheme, the person you care for must live within the City of York Council’s boundary. If you do not have Be Independent services you can still register as this scheme is separate from their alarm call service. You will be asked to complete a registration form giving details about yourself and the care needs of the person you look after. You can download the registration form below or we can send one out to you. If you need any help filling in the form we will be able to help you. Who can be an emergency contact? Anyone who is willing to be contacted in an emergency. They may need to provide some short term care but that will depend on what is included in the emergency plan. Contacts do not have to live nearby if the carer is happy that they would be able to provide an appropriate level of support in an emergency, for example over the phone. You will be asked to nominate up to three emergency contacts: these can be family members, friends or neighbours. There is a guide for emergency contacts available to download below that gives more information about what they are expected to do. If you do not have any people who you can ask to be emergency contacts you can still register, as ‘Be Independent’ will assess the situation and make sure that appropriate care arrangements are made for the person you care for.